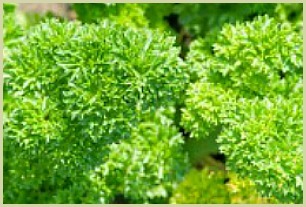 Curly Parsley | Very Healthy, Tasty and Most Definitely a Super Herb! Of all the world’s herbs, it is the simple curly parsley (petroselinum crispum) that you find most often in your daily cooking. It is the most popular herb on the planet, and for very good reason! You see it there adorning your dinner pasta, snuggled next to your lunch-time sandwich and chopped finely into your snack of salsa and chips. While it may seem innocuous and ever so common, there is a world of flavour in parsley, a treasure trove of nutritional value, and a hot global debate over which is better; flat or curly. It's native to areas around the Mediterranean, growing everywhere from southern France and Italy around to Algeria and Tunisia. The ancient Greeks considered it a sacred herb and used it to decorate its athletes and the tombs of the dead. It was also widely used as a medicinal herb all around the Mediterranean, and the idea of using it as a decorative garnish dates back to the ancient Romans. Read more about the health uses. Since ancient times, the use of parsley has spread around the world, and it thrives in full sun and well-drained soil and is the perfect plant for all gardens. Below are just brief tips, click here for my detailed step-by-step guide to growing some. It's notorious for being slow to germinate, but if you soak your seeds overnight and the freeze the seed before sowing, it does help speed the three-week process a bit. Sow indoors in early April, and place your germinating seeds somewhere warm such as a sunny window. In late May, after the last frost, you can transplant your young plants out to the garden. Make sure the soil is rich and that you water weekly. The plants also do well with some compost around them to start off. Note: Of the two main varieties; curly and flat-leaved. Flat leaved parsley is somewhat more tolerant of rain and sun. 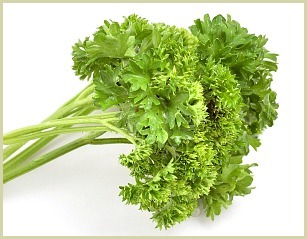 Read more about curly parsley. Basil - Growing and Using the "King of Herbs"